Charlotte Endymion Porter, originally named Helen Charlotte Porter, was born on January 6, 1857 in Towanda, Pennsylvania. Charlotte adopted the middle name Endymion after a poem by John Keats. In 1885 she graduated from Wells College in Aurora, New York. 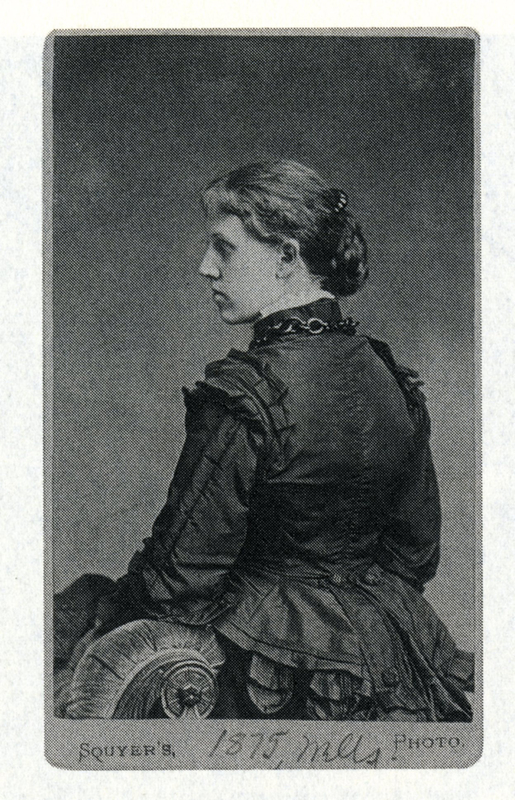 Eight years later Porter became the editor of the journal Shakespeariana, where she met her life partner Helen Clarke. Clarke submitted an article to Shakespeariana and Porter accepted it. Their friendship was built upon their mutual love for Shakespeare and Robert Browning. Porter and Clarke also founded the American Drama Society, and together they edited volumes of both Robert and Elizabeth Barrett Browning’s poetry. Porter published a theatrical version of Robert Browning’s tragedy, The Return of the Druses, which she directed in 1903. She was one of the brightest literary critics and editors of her time. Below is a signed copy of Porter’s script, featuring notes in the margin. The notes most likely were written there by a stage manager, as they list props and sound cues. Charlotte Porter. 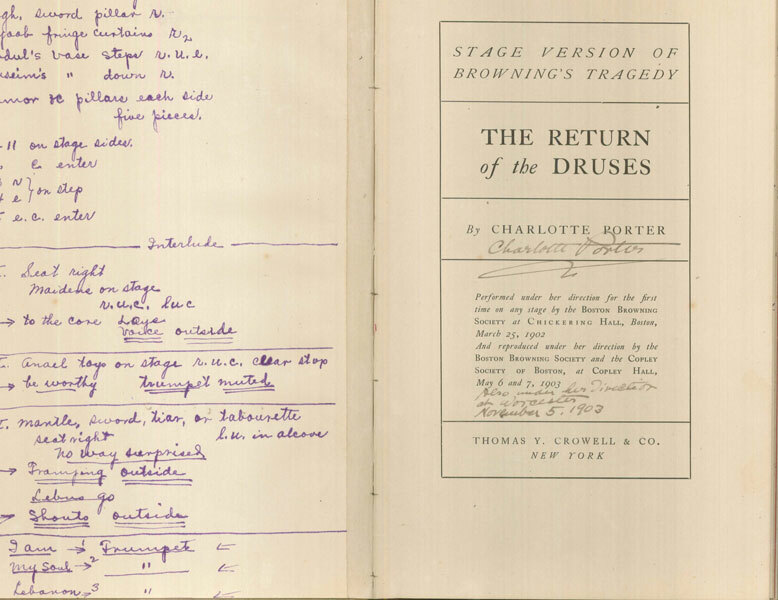 Stage Version of Browning’s Tragedy: The Return of the Druses. New York: Thomas Y. Crowell & Company, 1902. 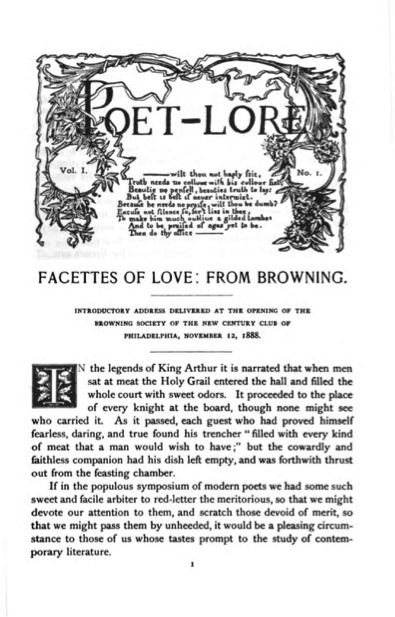 D. G. Brinton, “Facettes of Love From Browning,” in Poet-Lore, Vol. 1 (1889), pp. 25-26. In 1903 Porter and Clarke sold Poet Lore and worked on many other projects together, including several editions of Browning’s poems, a six volume edition of Elizabeth Barrett Browning’s poetry, and a twelve volume “Pembroke” edition of Shakespeare. Porter and Clarke committed to each other with a ring ceremony and lived together until Clarke died in 1926. Porter continued living at their summer home in Maine until she passed away on January 16, 1942. This poem from the first edition of Charlotte Porter’s book, “Lips of Music.” speaks about the island in Maine where she and Clarke spent their summers and where she eventually died at the age of 85. Charlotte Porter. 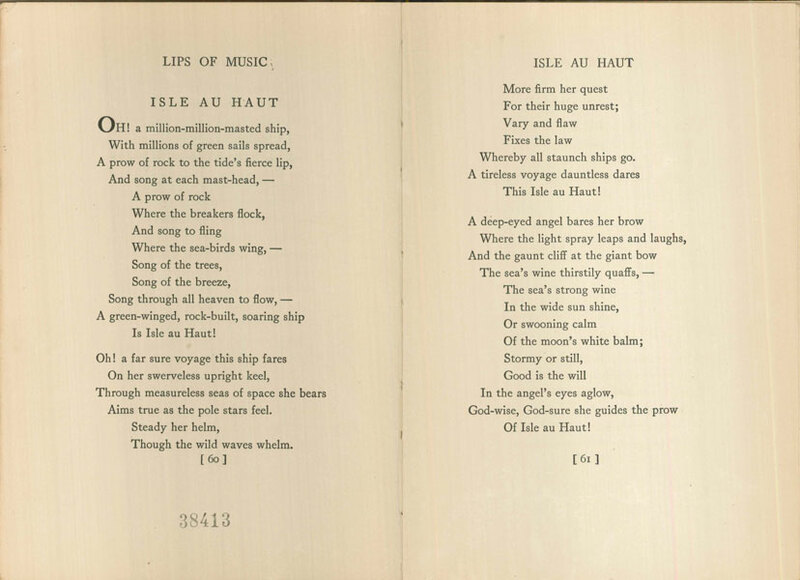 “Isle Au Hait” in Lips of Music. New York: Thomas Y. Cromwell & Company, 1910. The Armstrong Browning Library has two letters written to Charlotte Porter, six books and articles by Porter, and numerous Browning volumes edited by her. 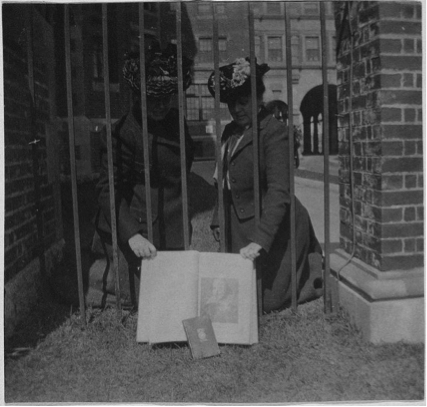 This entry was posted in Exhibitions, Giving Nineteenth Century Women Writers a Voice and a Face and tagged Armstrong Browning Library, Baylor Univeristy, Charlotte Porter, Helen Clarke, Lips of Music, Nineteenth Century Women Writers, Poet Lore, Robert Browning, Shakespeariana by melindacreech. Bookmark the permalink.